Title text: Thanks for bringing us along. I don't think there's anything to say other than "Aw. [sniff]". I also came here just to say "awww". 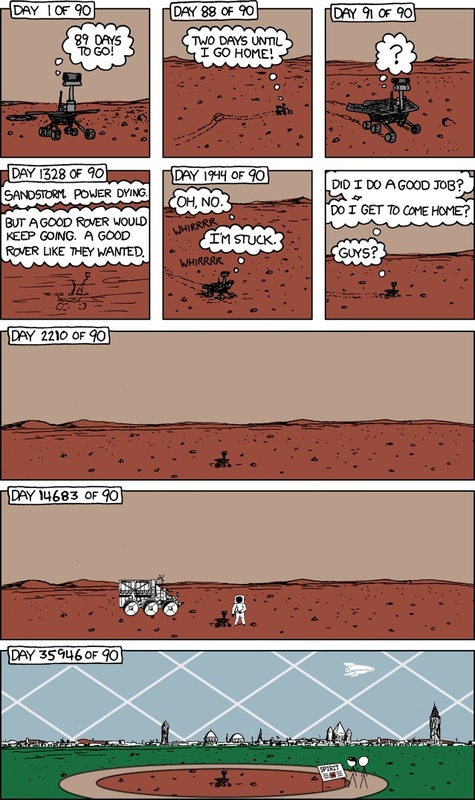 The Martian rover comics are some of the most touching. Wow, right in the feels. Next to the classic Spirit of course. This is the first time I've disliked an XKCD comic. The idea that 'share' is good -- when it invariably means "I am showing off" -- is deeply, profoundly, unpleasant. Yes, it is great that those photos are available to many (although not all). But they would be just as valuable if only one human -- or none -- saw them. Some other 'intelligence' could come across them in the near or far future -- and they would be every bit as significant. mfc wrote: The idea that 'share' is good -- when it invariably means "I am showing off" -- is deeply, profoundly, unpleasant. I think you're reading some different comic. I'm seeing "discovering new things is better if shared", which is not at all the same thing as "sharing is good". And if nobody ever saw Discovery's data, it'd be useless and senseless. It is emphatically given value only by the fact that people can see it. TimSheahan wrote: Wow, right in the feels. But it was a much more positive feels. That Spirit one should have been titled "How to Make an Engineer Cry". #ThanksOppy. I owe you so much. mfc wrote: This is the first time I've disliked an XKCD comic. The idea that 'share' is good -- when it invariably means "I am showing off" -- is deeply, profoundly, unpleasant. I strongly disagree that the photos whould be just as valuable if no living beings saw them. Your statement of "no humans" seeing them is predicated upon other sentient beings seeing them, which... I mean... yeah, OK, sharing things with aliens is great too! I hope that when we inevitably wipe ourselves out, some fragments of our culture are preserved for aliens to find, because it's a little lonely thinking about everything humans ever did disappearing with nobody left to appreciate any of it. Honestly, though, you seem to be quibbling for the sake of quibbling. The idea that 'sharing' is good does not invariably mean "I am showing off", and how you could possibly interpret that from a comic about the Mars rover sharing its discoveries on Mars is... well, you can't. The Mars rover isn't showing off "I have the biggest cliff", or anything like that, so your injection of yourself into this argument was fabricated from nothingness, picking a bone where there wasn't a bone to pick. 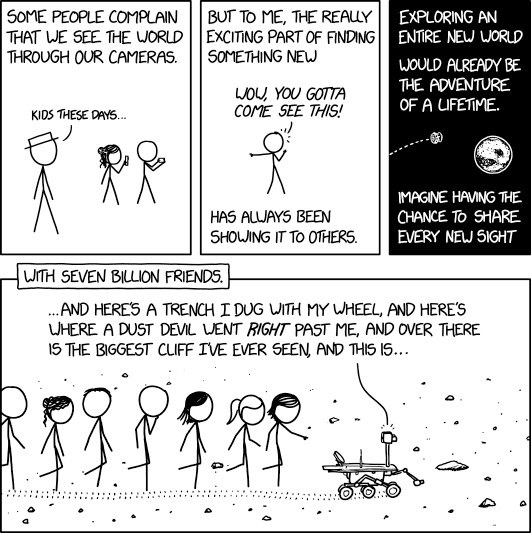 When I heard the news I figured it would be in today's xkcd because I am certain there is someone at jpl or nasa who has Randal's phone number and gave him a heads up. The alternative is that Randal drew the comic and then the folks at nasa or jpl saw it and shut the poor little guy down. I prefer to believe the former, the latter is too disturbing to contemplate. Surely they should have done something in response to that other comic. I don't mind people taking lots of pictures to share. Or even taking lots of pictures that -- whatever their intentions -- they will never actually get around to look at ever again. "Here's a picture of me NOT looking at the thing that I came to see." "Here's a picture of me blocking the view of something important". "Here's a picture of me making it hard for other people to see what they came to see." At least when Opportunity took a selfie, it was to get a better sense of scale to the object being photographed. RIP Opportunity. As one of the 7 billion: thanks for sharing. I am, and it did. By that same logic, no one here needed you to share / show off your opinion. Note that I am not, by any means, attempting to silence you or suggesting you should not have posted. Rather, I am criticizing your logic. There is, IMO, absolutely a place for healthy sharing, self-expression, and even ego or pride. I'm genuinely a bit sad that you don't seem to have encountered those yet. I totally agree with the above comments. This one really got to me. Somebody expanded on that for a 'happy ending'. Sorry it's small...can't get at the "original". NetNanny prohibits Reddit.